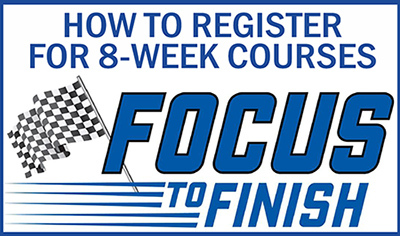 Learn more, earn more with EIGHT-WEEK CLASSES KC! Many people would like to attend college, but they are frustrated because they simply do not have time. Parents, full-time employees (and those who are both) often feel that two classes totaling six credit hours are all they can manage at one time. KC looks to get rid of this frustration by developing pathways to student success by SHORTENING most courses from 16 weeks to only EIGHT weeks. How will eight-week courses work? Eight-week terms will give part-time students the opportunity to attend KC on a full-time basis. By the fall semester, a student who is able to take only two classes at a time could do so twice in a single semester - by taking two eight-week classes during the first half of the traditional 16-week semester, then taking two more during the semester's second half. Completing four classes (a total of 12 semester credit hours) in a single semester (still just two classes at a time) will classify a student as a full-timer and could cut the time they spend in pursuit of a certificate or degree in half. Those who are already full-time students at KC, or students who plan to be, can also expect to benefit from the new class configuration. Is the success of eight-week courses proven? Studies show that full-lime students who take just two or three classes every eight weeks are better able to maintain focus and and excel. By the ninth week of a traditional semester, burnout tends to take a toll and drop-out rates become noticeably higher. With the eight-week model, students should experience a lower chance of burnout due to the shortened terms. Why is the eight-week model so great? Avoid the burnout most students get with long semesters. Avoid feeling overwhelmed with fewer courses to take at the same time. Avoid juggling multiple assignments and deadlines. What is Cruise for Success? Cruise for Success is the ULTIMATE student incentive program! It is Kilgore College’s way of encouraging student success by giving students an opportunity to win prizes as a reward for doing things that are proven to increase overall success in college. LEARN MORE! CLICK HERE!